Hindi Lyrics 4 U: Lyrics Of "Disha Disha Bahe Hawa" From Latest Album - Disha Disha Bahe Hawa (2016). 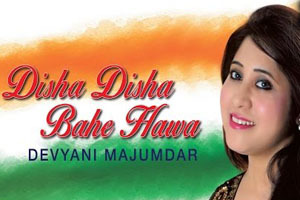 Lyrics Of "Disha Disha Bahe Hawa" From Latest Album - Disha Disha Bahe Hawa (2016). A patriotic song sung by Devyani Majumdar and music composed by Prithvi Gandharv. The video of this song is available on YouTube at the official channel Zee Music Company. This video is of 6 minutes 52 seconds duration. Lyrics of "Disha Disha Bahe Hawa"
Lyrics in Hindi (Unicode) of "दिशा दिशा बहे हवा"